In this country lead figures became popular for gardens in the late 17th into 18th C partly because they could be reproduced once a mould had been made and also the material was cheaper than stone or bronze. Key makers of this time were John Van Nost of Flemish origin who arrived in England in the late 17thC and was highly regarded for his skill and work with lead through to his death in 1710. The business was carried on by other members of the Van Nost family until John Cheere took it over in 1737. He was to head up the field in lead making in England – based in London - for the next 50 years. There were obviously other makers but John Cheere was prolific and took over several other yards in London during that time. Many examples of his work survive today. The actual making of the lead figures was a multi processed one and too complicated to describe here. Very basically moulds were made in clay mixed with ashes or fine sand to cut down the risk of cracking. 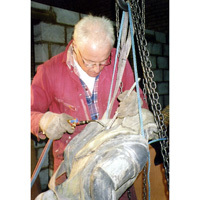 A hollow lead cast would be made in pieces which a blacksmith would then solder together around a central wrought iron structure which would form the core of the completed statue. The cavity would have been filled with plaster of paris. This might have been combined with all sorts of other refuse from the yard – bits of stone, broken tools even – all sorts of items have been found within these early figures. The completed statue would most probably have been painted – in many cases painted white to resemble stone or marble and mounted onto a stone base. Later into the end of 19th and the 20thC figures would have had lead bases. For no apparent reason lead ornament making in the ealy 19thC was negligible but there was a revival in the later 19th and through 20th century. These are the figures most often found for sale today. The big makers of this era being The Bromsgrove Guild (1895 onwards), J.P. White 1855-1917 and H. Crowther (early 1900’s) as well as the lesser known Italian makers in London – Peretti and Vangelisti. This little business was born of a love of gardens, this land, its history and the skills and materials of times gone by. We travel the country sourcing items of ornamental and historical merit which were made here and have in many cases had a working life over hundreds of years. Now, when placed and used in a garden setting it is no surprise that they give a natural feeling of belonging, age and grounding. Many of the antique stone troughs we find, for instance, have been water or animal feed troughs on farms in this country for upwards of 200 years. They were carved by hand, out of the local stone, by the farm workers on the specific farms. They were functional but in themselves skillfully and beautifully made. The workmanship in them is still plain to see, the rounded edges, the colour of the lichens and mosses gained over time adding to their feel and beauty. I often get asked– how a newly made stone trough or staddle stone can be made to look like the originals. – maybe yoghurt or cow dung they say – 250 years of work and weather will help! You will never sense the history unless the history is there. You simply cant beat the real thing – so why? We need to treasure these pieces of our past. There is something really special in owning a bit of this past no matter how small. Is it ok to plant directly into a copper pot? Do the toxins leak into the soil and kill the plants? Is it necessary to line the pot before planting? There is much debate about all of this but is seems that although – yes Copper does leak toxins into the soil, it is in such tiny tiny amounts that there will be no problem to any plants. Common sense would tell me that good drainage is all important. I have many customers and others who have been planting directly into copper coppers and other copper pots for years and years with no detriment to the plants contained within them. 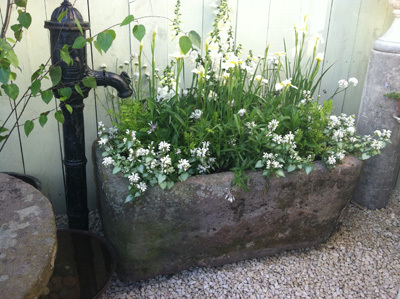 + Copper pots with their wonderful verdigris colouring make fantastic planters and are a beautiful addition to the garden. 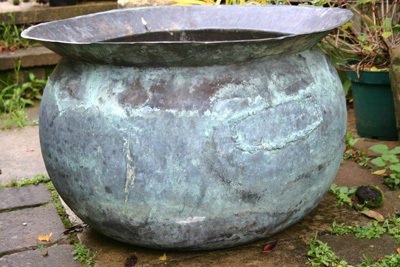 + Many people use larger copper pots as small pools. The ‘experts’ say that this also is very much possible and not detrimental to the plants or even the fish. Perhaps you could give me some feedback on this one as I have no experience myself. TIP Where drainage is needed - If possible don’t drill drainage holes but knock a screwdriver or something through the base to make holes so that the copper could be re-welded if necessary at a later date. Drilling holes loses the copper. J’s Garden Notes is going to come out 3 times a year. We hope always to include articles of interest in various topics to do with gardens, design, ornaments and antiques. We plan to include various authors - adding their expertise along the way. "Water holds the light of the sky and reflects as in a magic mirror the shadowy forms of clouds and trees. It is always a delight to come upon water in a garden. The gleam of a pool creates a sense of stillness. The smallest pond makes of itself a place of peace. One never grows tired of watching reflections. No matter how enticing the rest of the garden may be with flowerbeds, orchards and lawns, it is to the pond that your steps will turn for there is an irresistible fascination about water. It is by the pond that the eye is rested and the heart made quiet." 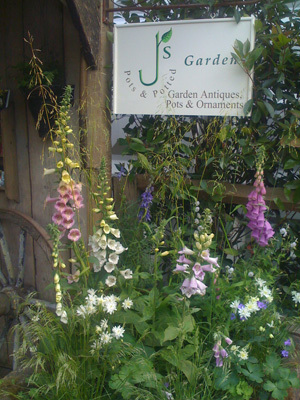 It has been a really busy summer this year for us – hence the rather tardy ‘Summer’ edition of J’s Garden Notes! We are exhibiting some exciting items of stock at the Hatfield House Country Show in Hertfordshire 19th, 20th and 21st August. Keep up to date with our website to see pictures and dimensions etc of these pieces as they come in. In September we will be holding an exhibition of Garden Antiques, Pots and Ornaments in the wonderful gardens at Hopleys Plants Ltd, High Street, Much Hadham, Herts SG10 6BU. If you have not been to Hopleys you are missing a real treat. They have the most wonderful plants there. The gardens are extensive and we will be there with our display of items for sale from Saturday 10th September to Sunday 18th . Why not take the day off and make the trip to Much Hadham. There are lovely pubs etc around. Make a day of it. We’d love to see you there. Snailriver Co began when I left the Bulbeck Foundry in Burwell, Cambridgeshire. I set up Snailriver in 2001 to specialise in the restoration of lead statues primarily, but as time progressed other jobs materialised, such as wrought iron work, copper and cast iron. I’d always been interested in restoration work, probably as my father was an architect and his work mainly was the restoration of old buildings, including several churches. 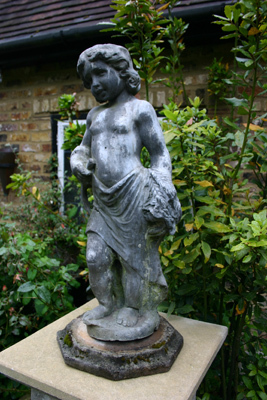 I restore all sorts of architectural items and garden ornaments. I have worked on many Coalbrookdale pieces in cast iron, which are quite tricky as often bits are missing so I have to model the missing pieces in clay, and then take a cast using silicone rubber and plaster to produce a pattern that the foundry can cast into malable cast iron. This is then dressed off and welded and/or pinned back to the original. Once the sandblasting and painting process has been done it is very difficult to see where the new piece has been fitted. 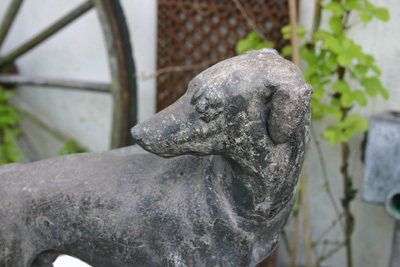 The same with lead statues - often due to the age and weight of the lead bits are missing. I cast new pieces where necessary and weld them back on to the figure. I enjoy patinating materials such as lead, bronze or copper having restored them as it is satisfying to match the existing patiner to the new work that I have completed. I recently restored a very large weather vane for an estate in Norfolk, which involved copper and wrought iron work, putting it back up was an interesting job, I’m sure health and safety would have had a field day as I had to stand on the ridge of the barn and lift a very large copper bird over my head onto the pin!